Justin Edinburgh accepts the pressure is still on the Cobblers as they head to Bury with their Sky Bet League One safety still not mathematically secure. But the Town boss is also comfortable and reassured that Town’s fate is in their own hands as they gear up for the final two games of the season. The Cobblers travel to Gigg Lane on Saturday knowing a point will guarantee their safety. They have a five-point advatntage over 20th-placed Bury, and are six points better off than fourth-from-bottom Port Vale, although Michael Brown’s men do have a game in hand. There is also the safety net of having of Oldham Athletic, Gillingham and Shrewsbury between the Cobblers and fifth-bottom Bury, with all the teams having fewer points than Edinburgh’s side. So although Town fans are still rightly twitchy and unhappy about their team’s position and the fact they are still in the relegation mix, Edinburgh believes the target he was set when he has given the Sixfields manager’s job in mid-January will be reached. “Everything is in our hands,” said the Cobblers boss. After Saturday’s trip to Gigg Lane, the Cobblers host Edinburgh’s former club Gillingham at Sixfields on the final day of the season, and the Town manager is promising that he and his players will be doing everything they can to get the team’s future secured as quickly as possible. “Anybody who knows me or works with me knows that the players won’t be taking their foot off the pedal,” said Edinburgh. 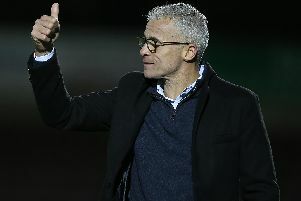 “We owe that to ourselves first and foremost, and everybody else connected with the football club. Bury go into Saturday’s game just two points above the relegation zone and desperate for the win that will go a long way to securing their own safety. The club have reduced ticket prices to just £5 to try and entice a big crowd through the turnstiles, and it is sure to be a lively atmosphere, but Edinburgh says it is all about what the Cobblers do. Both teams go into the match without a win in their past six games, and with both having claimed just three points from the past 18 available, with Bury claiming a useful 0-0 draw at second-placed Bolton on Tuesday. The Cobblers know a draw will secure their safety, and Edinburgh said: “We have to go to Bury and concentrate on ourselves. “I think Bury will be buoyed by their result at Bolton, because keeping a clean sheet there is good going as far as I am concerned, against a good side. “Saturday is their last home game of the season, and one they feel they probably need to get a result in to secure their safety, but we have to fight for our own.